National Library Week – Tell us what eBook you are reading today. Our Digital Library is available to you all the time, even when the Library is closed! Your Stonington Free Library card gives you access to a personalized online account where you can see a list of items currently checked out, place holds, renew materials and browse our collections. 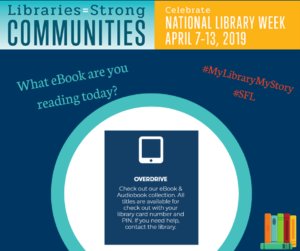 Our collections of digital eBooks and audiobooks are here too, along with resources from Connecticut State Library System, resources for job help and research databases. Check out all the online resources!